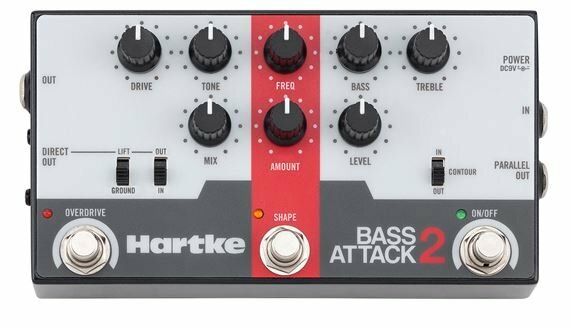 Shop Hartke Bass Attack 2 Bass Preamp/Direct Box with Overdrive from AMS with 0% Interest Payment Plans and Free Shipping. The ultra-clean Bass Attack 2 features Hartke's legendary Shape EQ, Contour and Overdrive effect. Combining Hartke's classic preamp/direct box circuitry into a rugged, zinc die cast stompbox-style design, the Bass Attack 2 allows bass players to sculpt their tone. Plus the Bass Attack 2 has a flexible output stage and vast array of tone shaping controls with 1/4" and balanced XLR direct outputs. Leveraging Hartke's years of experience focused on the needs of bass players, the Bass Attack 2 provides unique tone sculpting capabilities. The stompbox gives players access to Hartke's Shape circuit, which activates a specialized preset EQ curve that can be customized using the Shape Frequency and Amount knobs. Players can also add a little extra color with the Bass and Treble knobs, along with the dedicated Contour switch. Featuring a 1/4" parallel output for dry signals, a 1/4" effect output for your amp, and a balanced XLR direct output, the Bass Attack 2 provides flexible output options for FOH or studio recording consoles. Its direct output Pre/Post switch allows players to adjust stage sound without affecting the mix sent from the XLR to FOH. The Bass Attack 2 can also operate off of a mixer’s phantom power via its XLR jack. I have the Fender Squier V5 String Bass and needed some more punch and different tones. I am very impressed with the quality and tones I get. I very much recommend this item! Great value!!!!! Easy to dial in awesome bass tones. Tone choices are great and it's solidly built. Easy to use and pretty rugged looking! Easy to use , great product ... so far so good ! I fully recomend this pre amp , overdrive is great , DI was excellent so many sounds u can get out of this thing is amazing ! The preamp has some nice tone shaping options. Has a mid scoop button for fast eq'ing when changing to slap. Nice mid section for cutting through the mix. The od is more sizzle then crunch for my taste, but to each, his own. At $100 it's a bargain. It's in my bag and has been with me on my last 3 gigs. Not what I expected from Hartke. Saw YouTube videos demo of this unit..sounded pretty good. And it actually does dial in a useful tone I like. But it's basically nothing a parametric EQ wouldn't do..with the convenience of being a DI too. Knobs seem cheap and footswitch doesn't look very surdy. If u set it and forget it..it'll probably work for a long time. However I tried recording with it..using XLR out with the built in EQ I decided on..and a separate channel from the unaffected output of the DI. I had phasing issues I could hear in the headphones. Kinda like chorus effect only same pitch just receiving signal at different times. I don't think the advertisement really promised anything more than a DI with EQ (except the distortion feature that is unusable because there's no crunch..only sizzle).so if it's worth 149.00 to you for a DI with EQ..then maybe give it a try. If I had it to do over again..I should've just bought the GED 2112 preamp from SansAmp.